He was an old foundation Butler bull. He is respected for his many daughters who have sold well and developed over 50 and 60" horn. His top sons are Laramie and Farlap. He is one of the smallest of the Butler bulls and should be used on cows with good size. 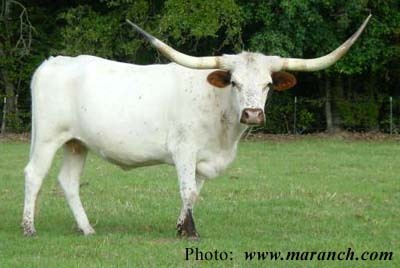 Most of his calves are white; to get a desirable color it is best to breed him only to cows with no white at all. 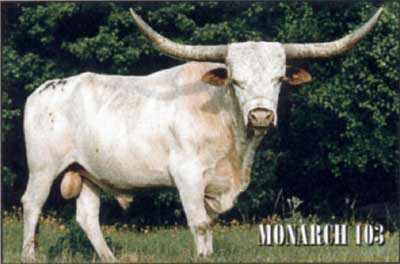 Monarch steers are perfect for roping as they grow rapid horn and retain a small body.